The Parent Advisory Council's mission is to involve families, schools, and the community in the educational success of all children through unified active participation, clear understanding, communication, and adequate training. The JCPS District recognizes that the parent is the child’s first and most important teacher and the parent’s continued involvement is essential for the success/achievement of the child. Therefore, JCPS is committed to building a strong school-parent partnership. To support the school-parent partnership, the following policy is in compliance with federal law and the JCPS philosophy that successful schooling is a shared responsibility requiring commitment and collaboration among parents, community, and the school. This policy was designed with meaningful consultation from parents of participating Title I students and will be made available to parents of all Title I students and the local community. Allocate 95 percent of the required 1 percent of the total Title I allocation to eligible Title I schools for the purpose of implementing quality, effective, and engaging parent involvement activities. 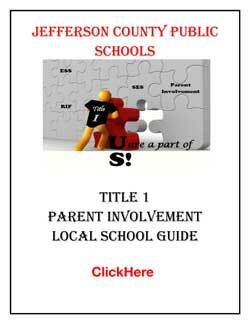 Parent involvement activities are those that improve student academic achievement and school performance.